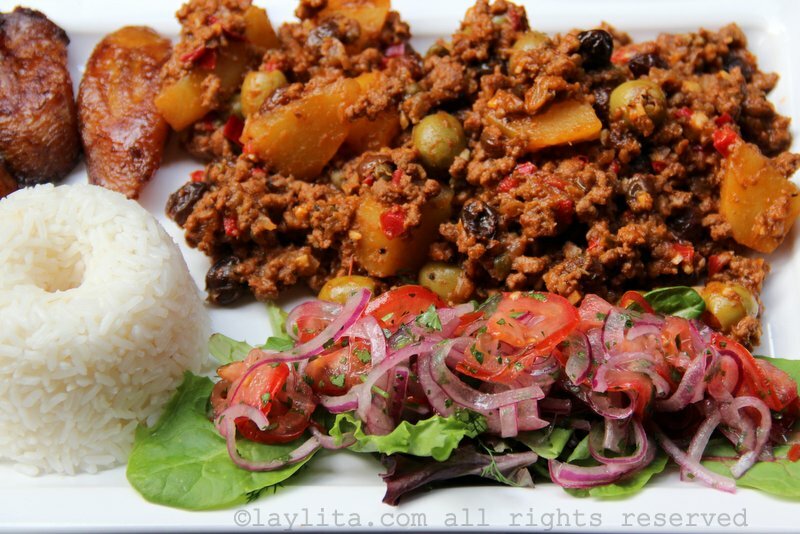 Cuban beef picadillo is a traditional dish made with ground beef, potatoes, onions, garlic, cumin, bell peppers, white wine, tomato sauce, raisins, olives and capers. Back in April we spent spring break in Austin, it was the first time we had gone back to Austin since moving to Seattle. One of the great things about the visit, in addition to trading 40 degree rainy weather for 70 degree sunny weather, was catching up with family and friends. I met Carolina, from Guayaquil, during my first year in Austin, she was visiting a mutual friend and came to my New Year’s Eve party – she brought a delicious shrimp ceviche to the party. She eventually moved to Austin with her husband Joe. 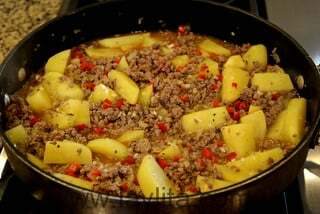 They invited us for a yummy lunch when we were visiting Austin and Joe made this amazing Cuban style beef picadillo. 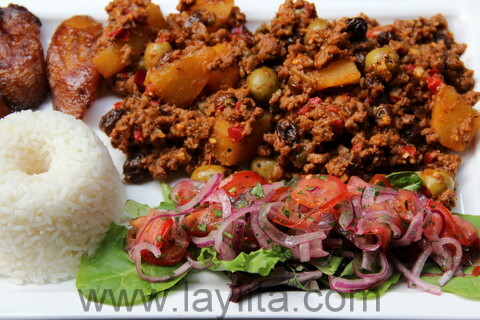 Cuban beef picadillo is a traditional dish made with ground beef, potatoes, onions, garlic, cumin, bell peppers, white wine, tomato sauce, raisins, olives and capers. 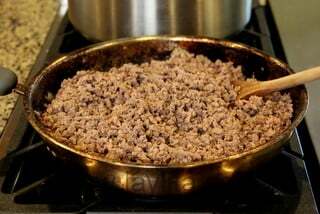 In a medium-size frying pan, brown the ground beef with a dash of cumin and pepper, drain off any excess grease, and set aside. 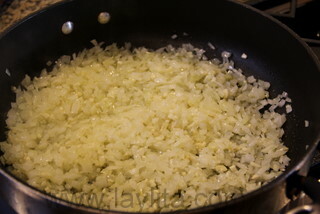 Add the chopped garlic and cook until almost golden. 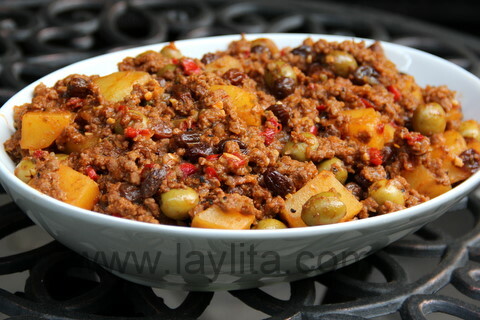 Mix in the bell pepper, cumin, pepper and a little salt – not too much as the olives and capers are salty. 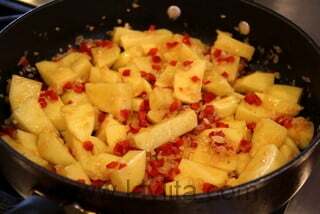 Add the potatoes pieces and cook for about 5 minutes. 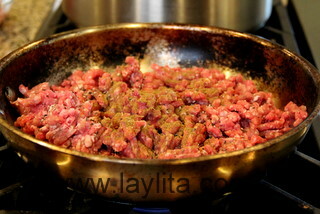 Add the ground beef and the wine, let the liquid reduce. 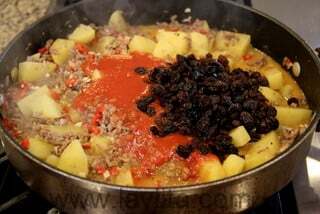 Add raisins and tomato sauce when the potatoes are about half-cooked (a knife can easily through the first part but the center is still very firm). 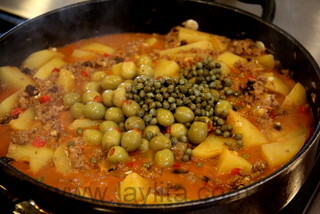 Cook for 5 more minutes and then add the olives and capers. 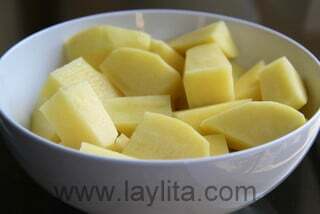 Continue cooking over medium heat, stirring occasionally, until the potatoes are ready. 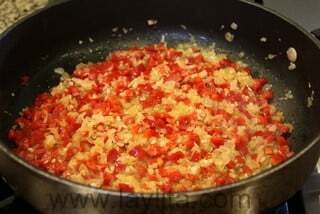 If the sauce thickens too much, you can add some more wine or a little bit of water. Taste and adjust any seasonings: salt, pepper, cumin or additional olives/capers. 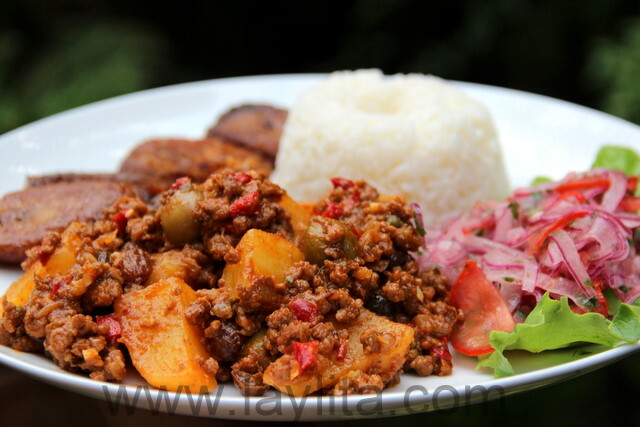 Serve with rice, fried ripe plantains and a small salad. You can also use ground chicken or turkey in place of the ground beef. Of course, I had to ask for the recipe and Joe was kind enough to share the recipe – and he did such an awesome job writing it that I barely adapted it before sharing it with you. 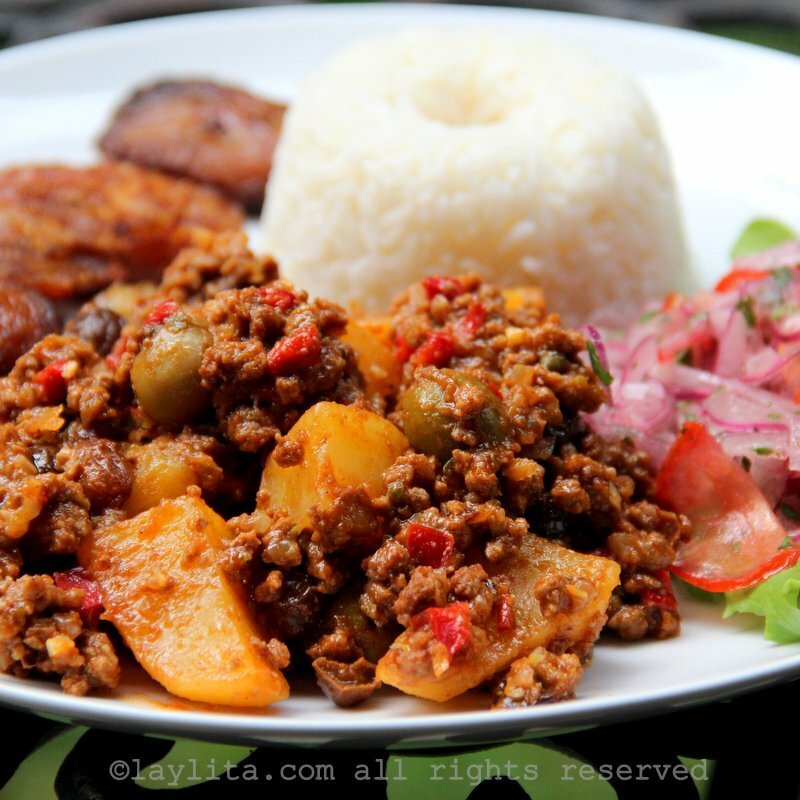 This picadillo recipe is very easy to make and is a perfect comfort food dish. 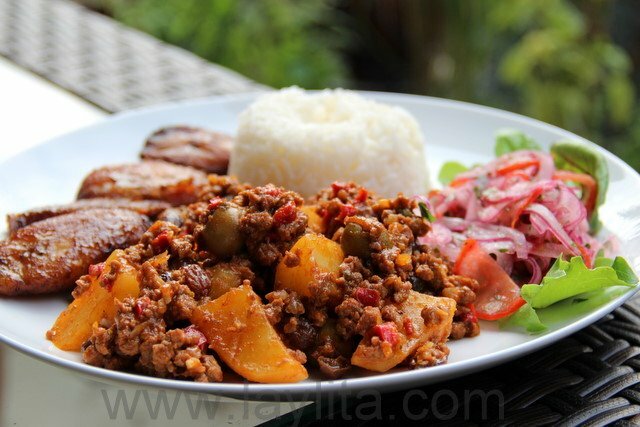 Picadillo is also very versatile, Joe suggested that the leftovers can be used to make pastelitos de carne or Cuban style empanadas – or any kind of empanadas. 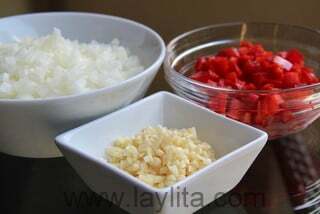 He also mentioned that if you make the beef picadillo without potatoes you can use it as a filling for papas rellenas, which are stuffed mashed potato balls that are rolled in a mix of bread crumbs and then fried – I will definitely try those soon. 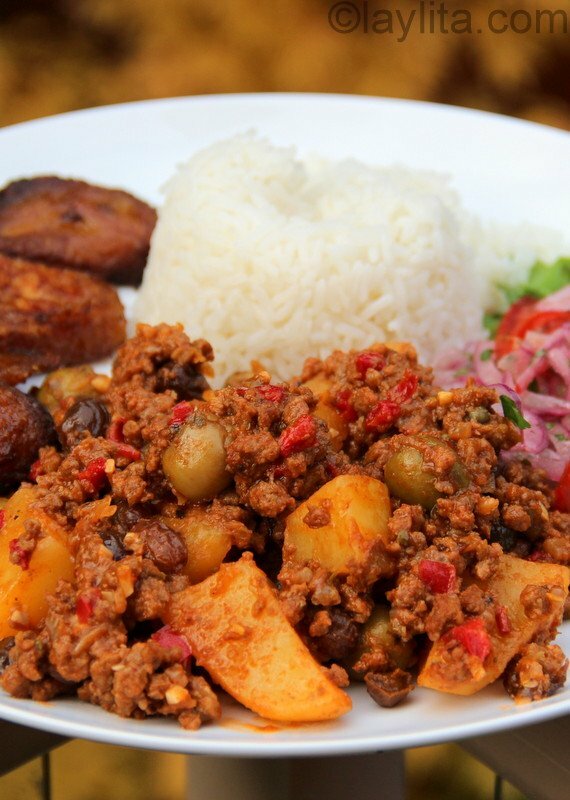 I served the picadillo with rice, a tomato and onion lime pickled salad, and fried ripe plantains. This looks delicious! 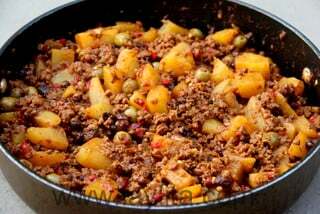 I have never put potatoes in Picadillo, but I have cut them in little cubes and fried them and served on top. Have to give this a try. I made this last night and it turned out perfect. Followed the recipe to a tee. Like the previous poster, I also had a little difficulty getting the diced potato pieces to soften…had to triple the cooking time & some of them were still hard. It was the strangest thing! :) never seen that happen before! But in the end, it was SUPER DELICIOUS!!!! I can’t wait to get up & eat another plate of it. I served with white rice, plantains, & ensalada de aguacate. My 2 year old was a big fan! This dish stretched for almost three nights for our family of three. I let it simmer for almost two hours and even though I diced my potatoes in tiny pieces, they were still a bit crunchy. So I think the potatoes need to be pretty cookd through before moving to the next step. Great recipe, we wil make again! Just have to say, this was amazing! Delicious recipe! Can you tell me how you made that salad?! It looks delish as the whole plate does!! Thanks for the recipe! Not the same when made with ground turkey. I’m looking forward to making this recipe. About how long, start to finish, does it take to prepare? About 1 hour to 1 1/2 hours. If you want you can do all the vegetable prep (peeling, chopping, dicing) ahead of time and have it ready. 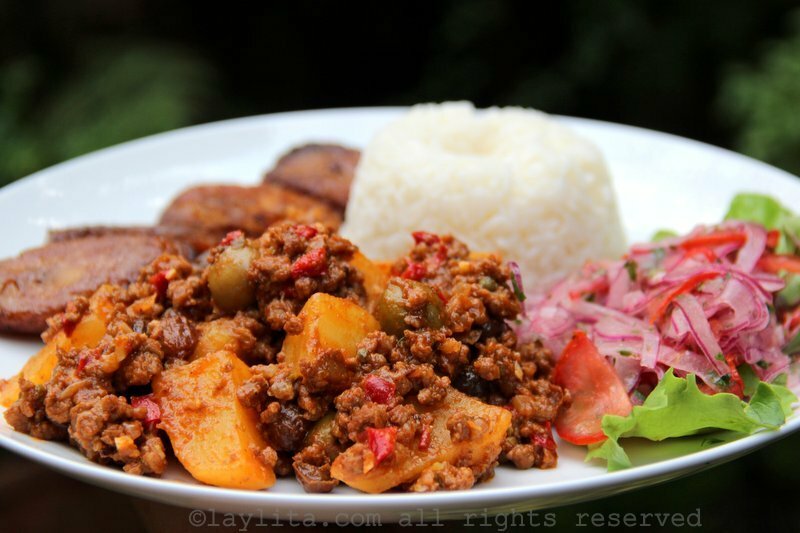 You can make the rice, plantains, salad while the potatoes cook. Can someone tell me how many this recipe serves? 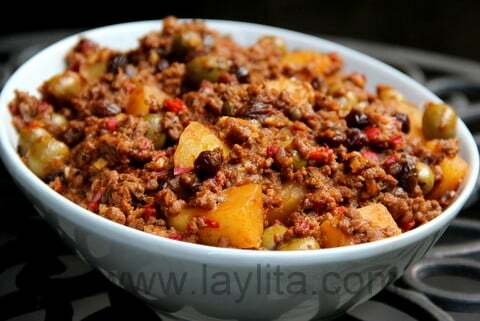 I love Picadillo! I have tried several different recipes and this is, by far, the best. I made a double batch yesterday and delivered it to a sick friend and his family. They RAVED about it and gave the ultimate compliment – they said it was as good as what their grandmother used to make. I just smiled and said I was glad they enjoyed it. Thanks for making me shine! Same delicious recipe as my Grandmother’s with the exception of cumin. substituted TVP for the beef & it turned out delicous. thanks for the recipe. How much TvP did you use? this looks delish!! Made this last night and turned out great! I really like the raisins though, so I tossed in a handful more. Also added some garlic powder bc felt that there wasnt enough garlic. Next time will cut up more cloves. 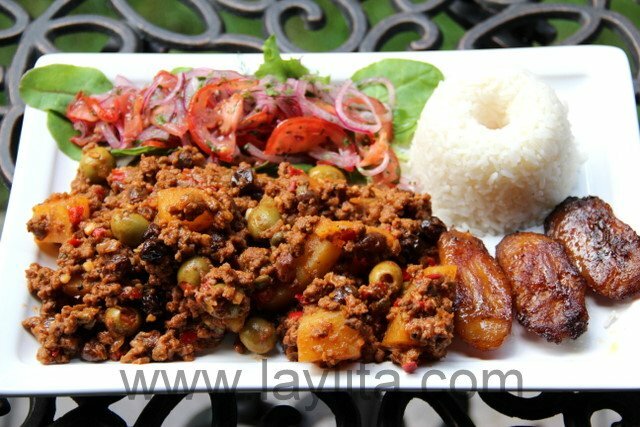 I was searching online for a Cuban recipe (I’ve never cooked a Cuban dish in my life) I came across a lot of picadillo recipes. I decided to go with your recipe and I am soooooo glad I did. Everyone in my family loved it! Even the kids! It was such a nice blend of flavors…this recipe is a keeper! Thank you! Looks yummy! I’ll have to try making this soon. Just discovered your website – love it. Can you suggest something to substitute the wine – no alcohol. Thank you!!! Hi Kelly – You can substitute the white wine with beef stock or chicken stock, add a dash lemon juice or cider vinegar to it (to mimic the acidity of the white wine). Perfect thank you making it again! Succulent — can hardly wait to try it. I loooove this website and ALL the recipes you post!!! You really make me feel like standing up and start cooking right away!!!! THANK YOU!! 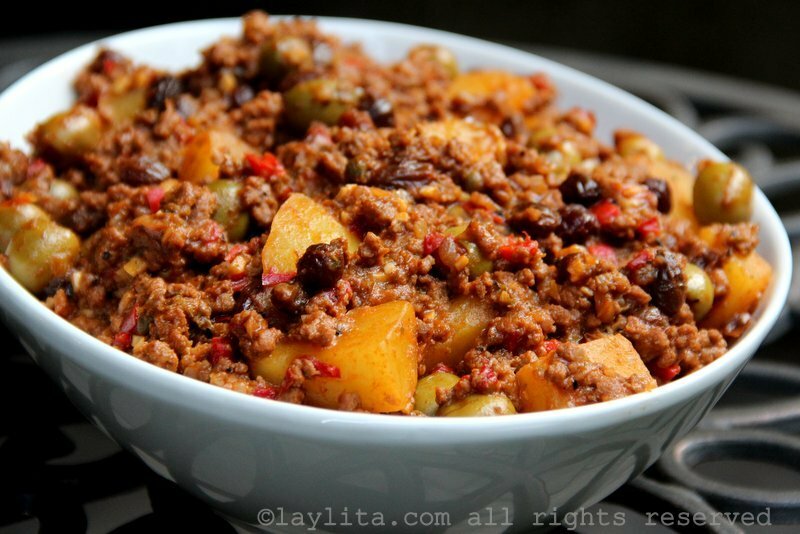 It’s funny how we all ave our own picadillo recipe. I always ejoy the Cuban version and yes, pastelitos sound good right about now. Great pictures. This really does look like empanada filling! We filipino’s eat something very similar but im not sure what the correct name is for the dish. We put fish sauce in it instead of salt and is truly delicious.